Provides a window where the outputs of the variables like voltage current and logic states may be viewed graphically when simulation is carried out. This function works like CRO where the variable (voltage, current, Logic states) may be selected and output obtained graphically with respect to time. Applicable for both Analog and Digital circuits for Time Domain Analysis. The output values may be recorded as PWL file, which can then be used in Signal Integrity Analysis on a driver node. 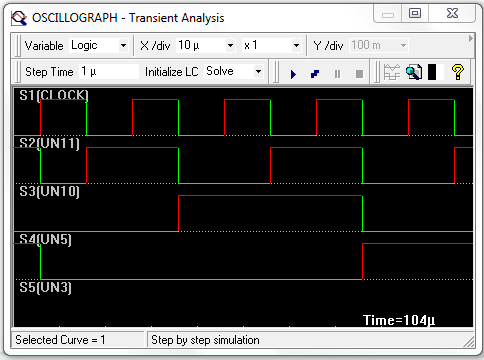 Set the required testpoints for the circuit and click Run Transient analysis (Oscillograph) from Simulation menu. A window OSCILLOGRAPH-Transient Analysis pops up where the required variable (voltage, current, Logic states) is selected. Set the scale factor for the X and Y-axis. The scale factor is determined by multiplying the value X/div multiplied by the times selected in the multiply combo. Similarly, the scale along the Y-axis is also calculated. The Step Time is given suitably. The step time determines the iteration time. Initialize LC allows manipulating the initial values of the state variables (capacitor voltages and inductance currents). Click the start button in the window and observe the graph. If necessary, the scale values may be changed to find the amplitude. The display of the output may be paused or stopped . The working of the Oscillograph is interactive, i.e. during run time of the simulation, waveforms may be added or parameters of the symbols may be changed. These changes immediately affect the output on the oscillograph. The net names displayed on the window helps to easily detect the waveforms associated with each net. During the simulation, the variables may be changed and output obtained changes accordingly. The settings made in the oscillograph window remains unchanged until Simulation module is closed. This helps the user to close the oscillograph window, do changes in the circuit topology, preprocess it and run ocsillograph. The icon when invoked displays the Simulation messages and icon toggles the background of the oscillograph either to black or white. The icon helps to record the output displayed as PWL file. Click this button and start simulation. The output values for each net, where the test points have been placed will get recorded, till the point simulation is stopped. These values are very useful while performing Signal Integrity Analysis. Note: Only 4 voltage and current testpoints and 8 Logic states are accepted by the Oscillograph. The rest of the testpoints are ignored.